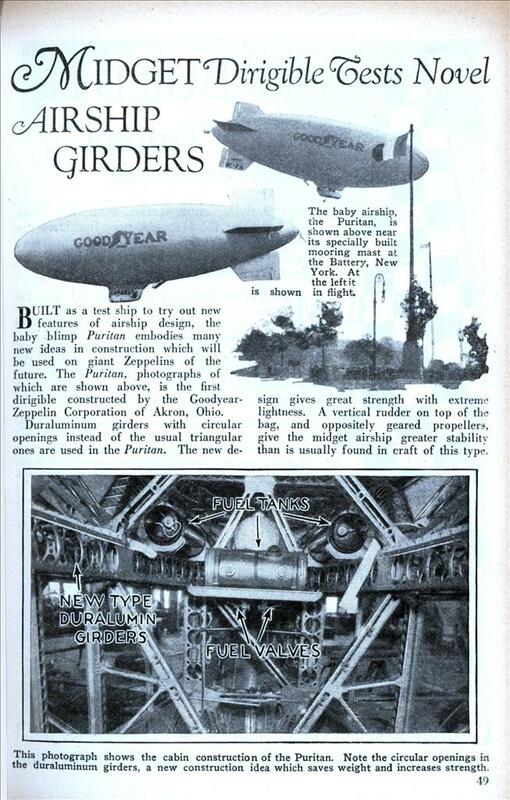 BUILT as a test ship to try out new features of airship design, the baby blimp Puritan embodies many new ideas in construction which will be used on giant Zeppelins of the future. The Puritan, photographs of which are shown above, is the first dirigible constructed by the Goodyear-Zeppelin Corporation of Akron, Ohio. Duraluminum girders with circular openings instead of the usual triangular ones are used in the Puritan. The new design gives great strength with extreme lightness. A vertical rudder on top of the bag, and oppositely geared propellers, give the midget airship greater stability than is usually found in craft of this type. It’s too bad that airships just aren’t safe enough to use as passenger carrying transports.How cool would it be to spend a few days cruising from LA to NYC? The cover of this issue is one of the funniest ones I’ve seen here! 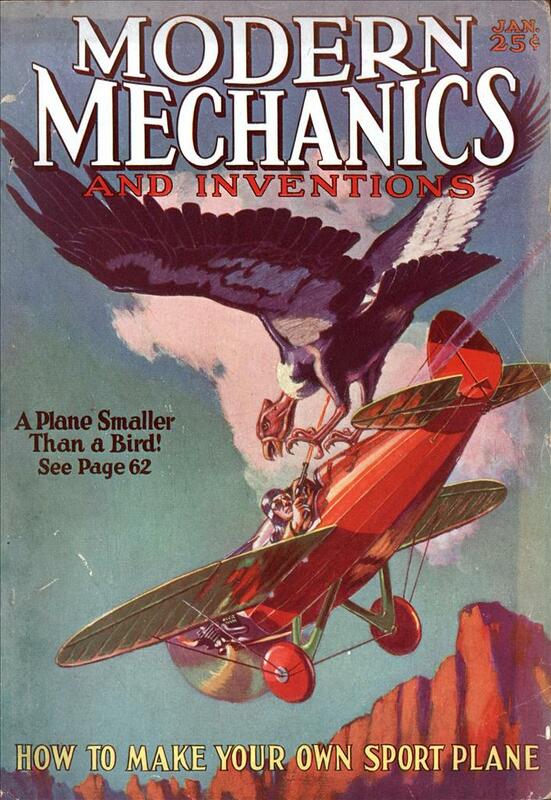 I’m guessing that’s supposed to be a condor attacking that mini plane. If so, the plane must look like carrion to it. And all pilots of such small aircraft are, of course, well advised to carry guns to ward those annoying pests off. LZ-127 Graf Zepplin flew more than a million miles and carried over 34,000 without a single injury. ZR-3 Los Angeles flew from 1924 to 1931 without losing a life and ended up being decommissioned in 1939. Goodyear currently operates 3 blimps. Airships are as safe as any other means of transport, and probably much safer than automobiles, the problem is public perception. It’s more the media that trots out the Hindenburg film any time lighter than air travel is mentioned. You’d think they were getting paid to do it as often as that old thing gets pulled out of mothballs.